What we discovered this year was pretty interesting. 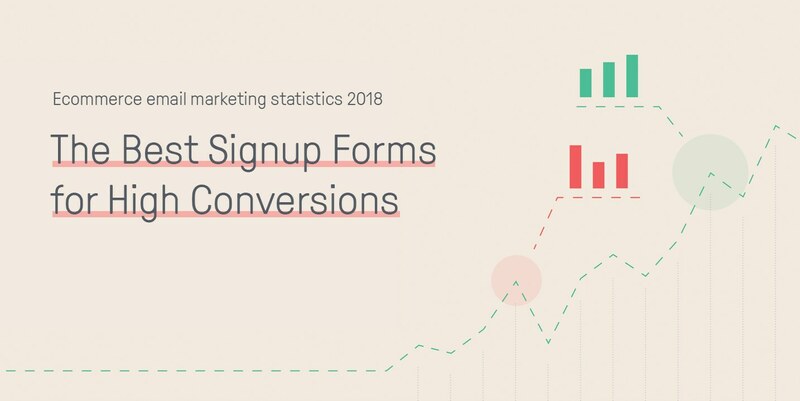 Essentially, we didn’t just want to look at which form had the best signup rates, but also what information and what number of fields lead to the best conversions. So, let’s take a deep look at the numbers and what it means for your ecommerce business in 2018 and beyond. 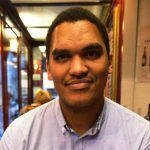 When it comes to looking at this particular data set (as with all data and statistics), it’s important to take these numbers with a grain of salt. Above, in the summary, I noted that popups had the second-lowest signup rate (3%), and that landing pages had the highest signup rate (23%). 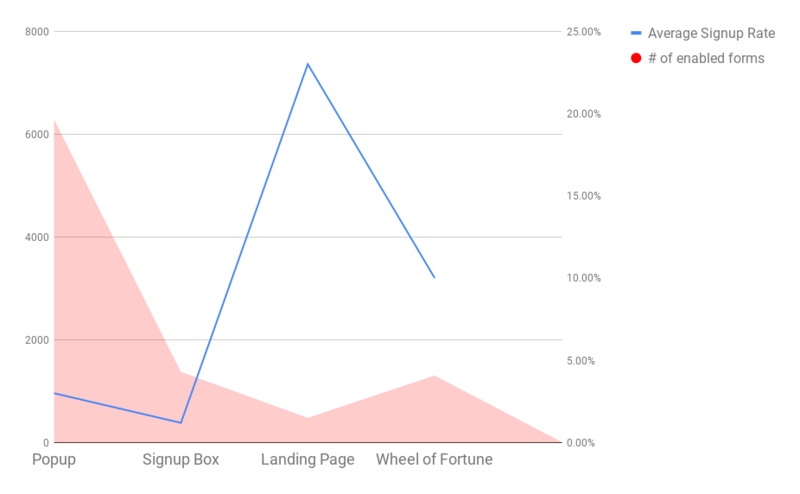 However, popups also make up more than 66% of all enabled signup forms, whereas landing pages are the least enabled, making up only 5.1% of enabled signup forms. Here you can see the situation. Popups are 13 times as popular as landing pages, so it makes sense that, with more usage, the numbers are going to be affected. Also, it’s important to look at the effectiveness of the signup form; i.e., how often it’s viewed. To appear to a visitor immediately or after some steps (such as x amount of clicks or the visitor attempting to leave). 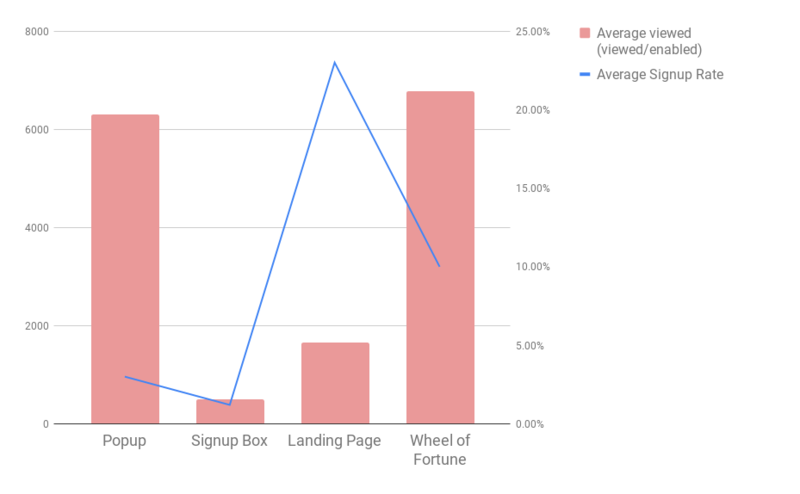 When it’s plotted against the average signup rate, we can see that the Wheel of Fortune is a pretty good choice, with a great conversion rate (10%) and the highest average view (6784 views/form). Taken with a grain of salt, you should probably continue using popups. However, you should also diversify your signup forms. The Wheel of Fortune here is a great option, and one you should definitely try out in your store. Let’s be straight-forward here: the standard information you’re asking for is your visitors’ email addresses. 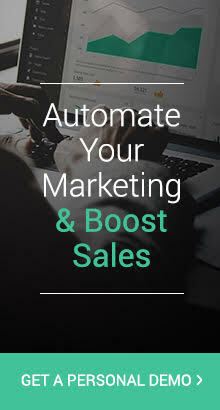 That’s the whole point of email marketing or marketing automation, to allow you to communicate to your visitors. The preferred way is via email, but there are other pieces of information you can get from your visitors that can really help your marketing efforts. For example, we’ve gushed over the amazing value of birthday emails and SMS/text message marketing over and over here. But guess what: if you don’t gather that information (birthday and phone number) from your subscribers, you won’t be able to use it. Which piece of information, in addition to the email address, leads to the best conversions? Usually ecommerce marketers are scared to ask for too much information, but we wanted to check that against reality. As you can see, the combination for email + first name is the most popular, with more than half of all signup forms using these fields. After that, the country and birthdate are the most popular. 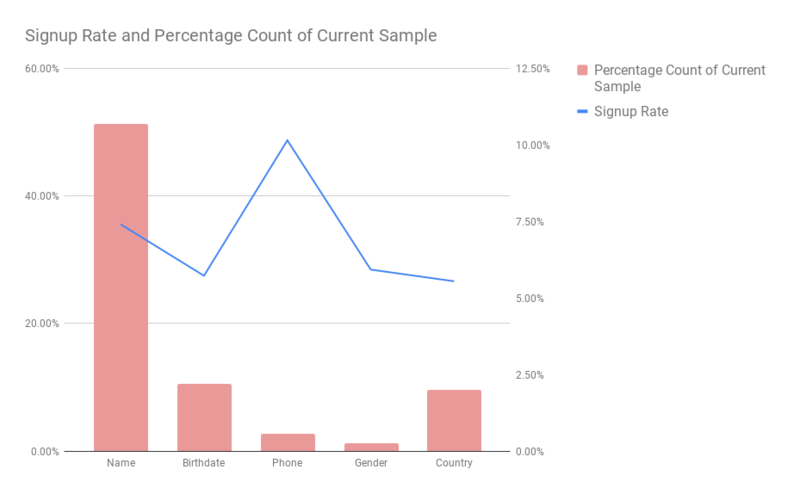 As far as effectiveness, the signup rate does a bit of a dance, but surprisingly the email+phone number combination seems to have the highest signup rate. 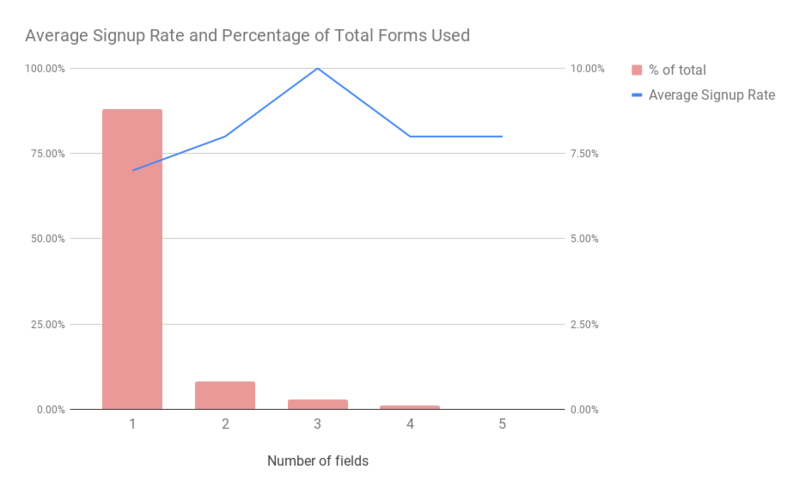 However, taken with a grain of salt—that it only makes up less than 3% of all signup form fields—we can see that the next best signup rate is the classic email address+name. The popularity and signup rate makes this a great combination to use on your own signup forms. However, birthdate also does pretty well (meaning you can finally use the birthday automation). For the best, most consistent conversion rates, ask for email address and name. For pretty great conversions, include the birthdate. We’ve all heard that asking too much information from your visitors can lead to lower conversion rates. We wanted to test that by seeing what the conversion rates are based on how much information is being asked. The default mandatory field is email address. But what if you wanted to (as we saw above) ask for two additional pieces of information: name and birthdate? Or four additional fields: name, birthdate, country, and phone number? Would your conversion rates drop dramatically? 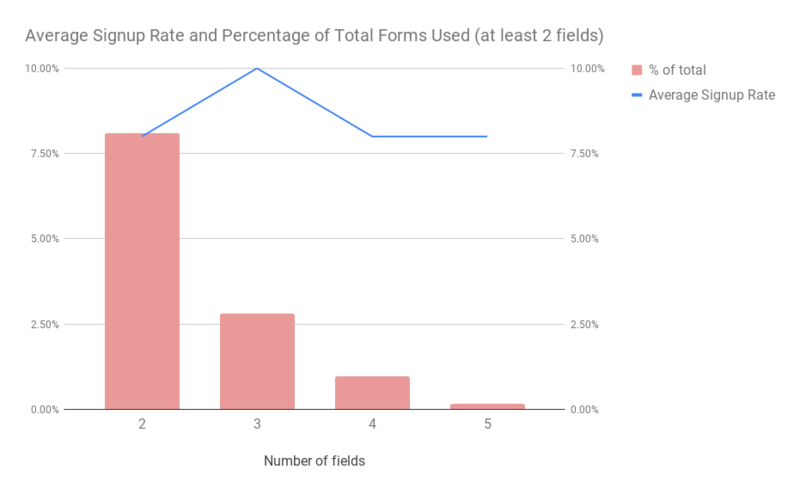 As you can see here, the most popular amount of fields (requested information) is 1, making up 88% of all enabled signup forms. With that, we’ve got a pretty good signup rate of 7%. Here, the numbers are a bit closer, so it’s easier to draw conclusions when using at least 2 fields. While asking for 2 pieces of information is most popular, the highest-converting is actually to ask for 3 pieces of information. That comes in at a 10% conversion rate, which is a pretty good rate. After that, however, there is some marked decrease in effectiveness. We can say that you may see some increases in your signup rates if you ask up to 3 pieces of information from your visitors. However, we’d advise you view this more as a test than an assurance. See if it works for your business. Test it out for a week or two, and then make your conclusions from that. Of course, here’s where our mantra comes into play: ABT – always be testing. Test out variations on your store to see which signup forms and what information leads to better rates for you. When you do that, come back here and let us know in the comments what those results were.